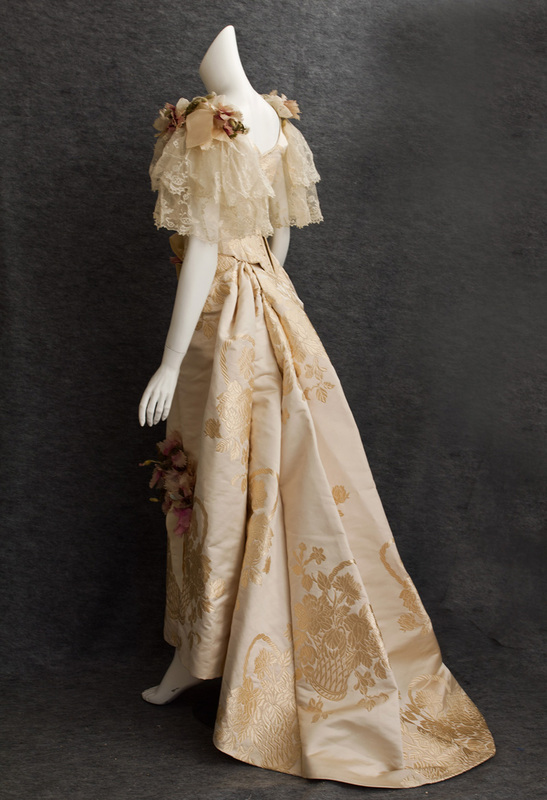 Charles Frederick Worth, the father of haute couture, is well known for his creations of intricate and immaculate dresses with remarkable attention to details. Even though House of Worth was so well known in the past (at the moment there's House of Worth somewhere in Paris, but I can not find it. Yet), if you're not fashion students and the designer of Balenciaga that you know is only Alexander Wang, you hardly hear about this couturier. But his legacy remains, stay beating and flowing and circulation in fashion veins of every designers in modern days. 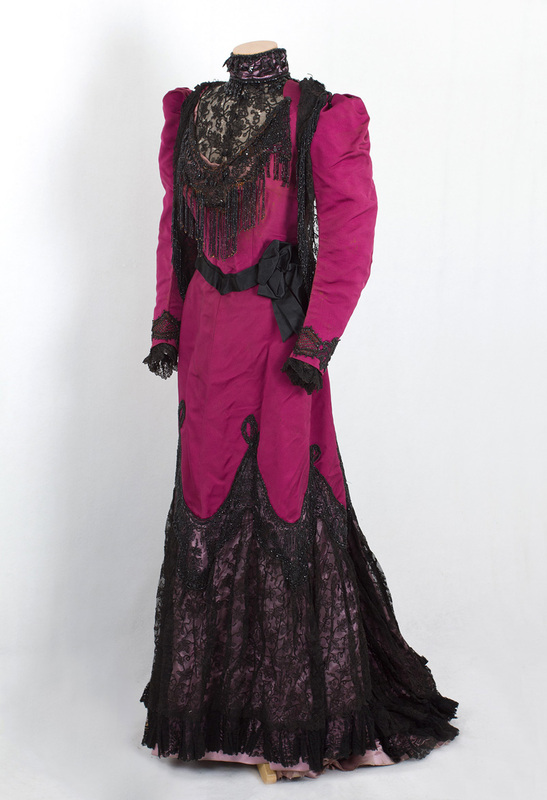 And now you can even posses the original dresses from House of Worth created by M. Worth and his very own son and apprentice, Jean-Phillip Worth! 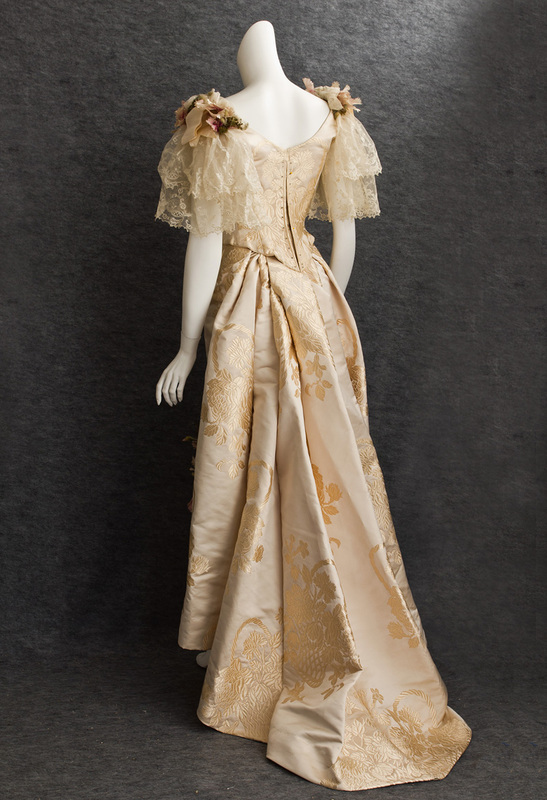 It was made from ivory/champagne satin damask from the House of Worth according to oral provenance. 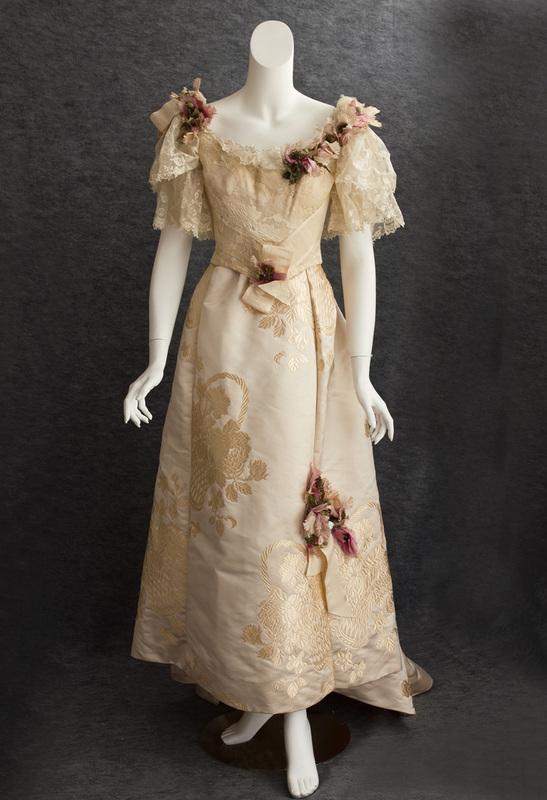 The chiffon damask overlay on the bodice front has a floral pattern that matches the flowers in the satin, adding a subtle textural effect to the overall design. 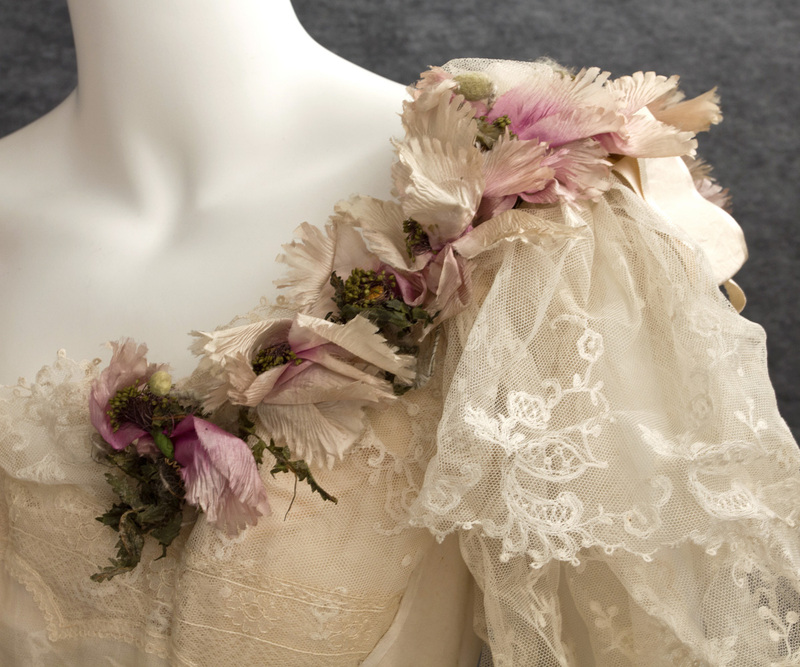 Note the perfect mirror imaging of the floral pattern on the back of the bodice. 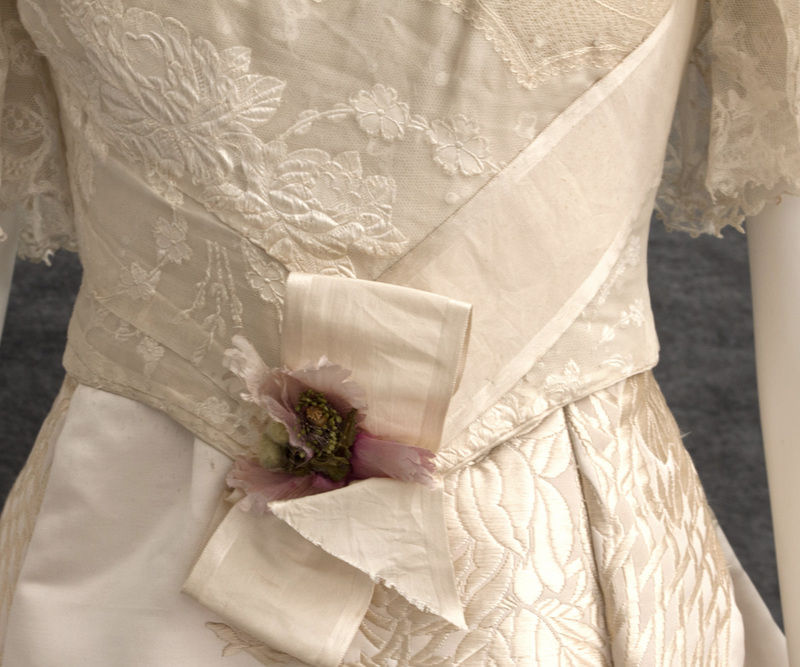 The bodice is boned and lined with ivory silk taffeta. 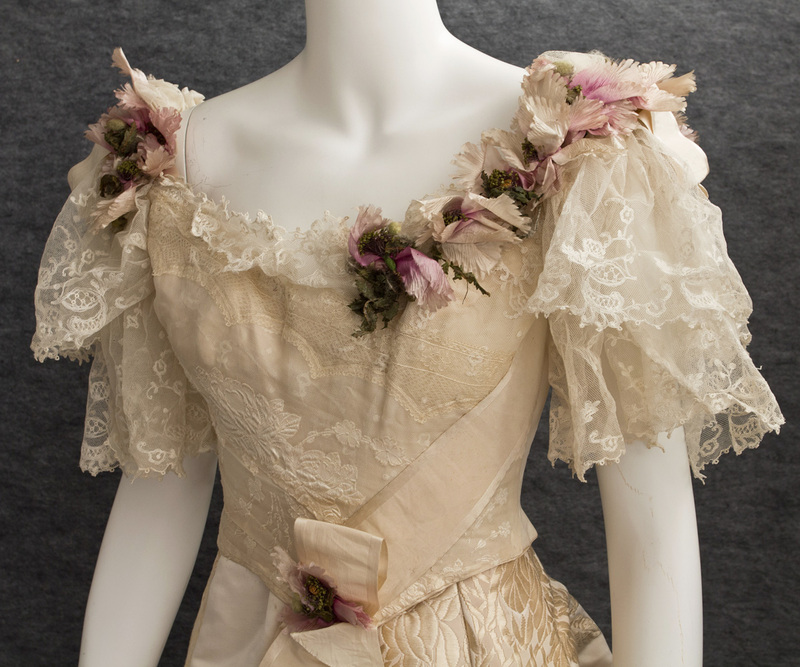 The sleeves and neckline insert are of matching lace. 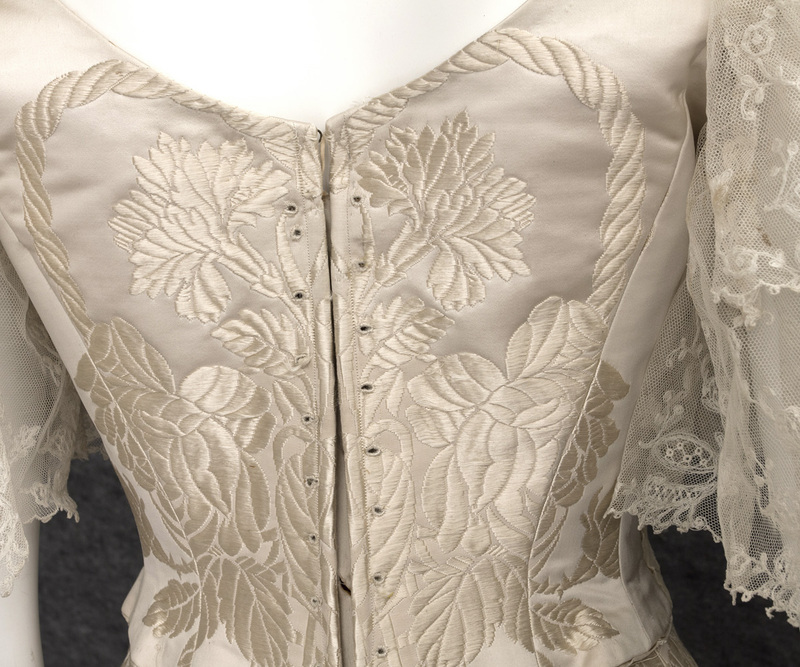 The bodice closes in back with lacing, which are missing. 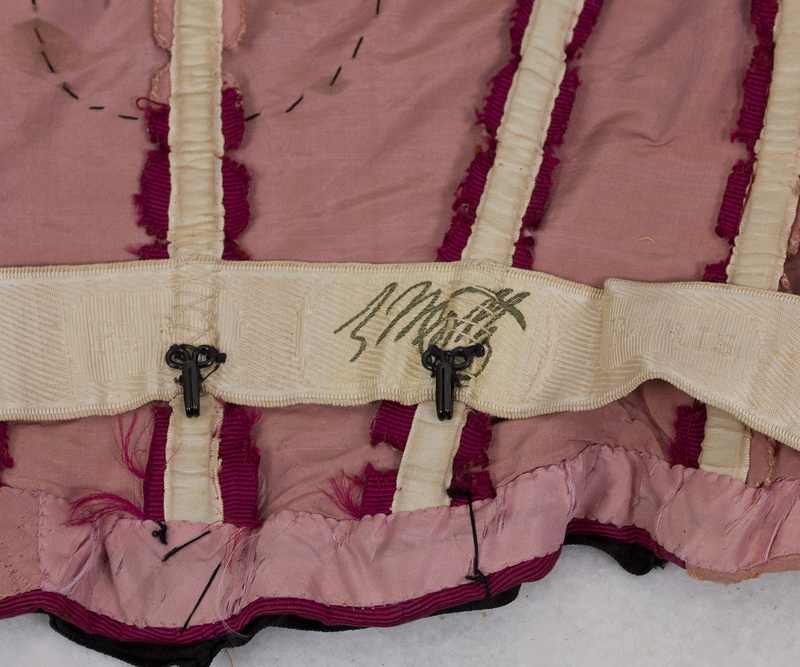 The skirt has a dramatic back train. 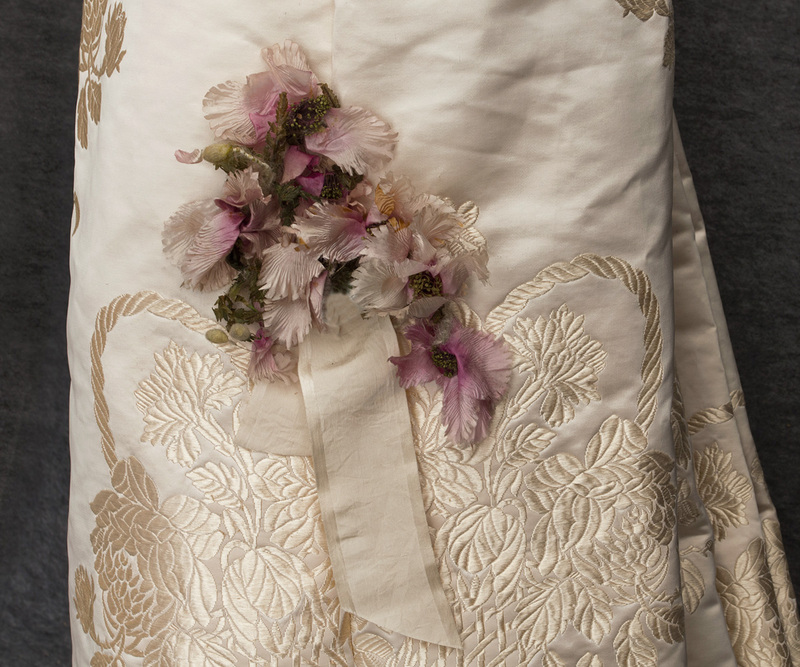 Both pieces are embellished with ribbons and bouquets of fabric flowers. The condition is almost excellent. The only problem could be found is the missing back laces. 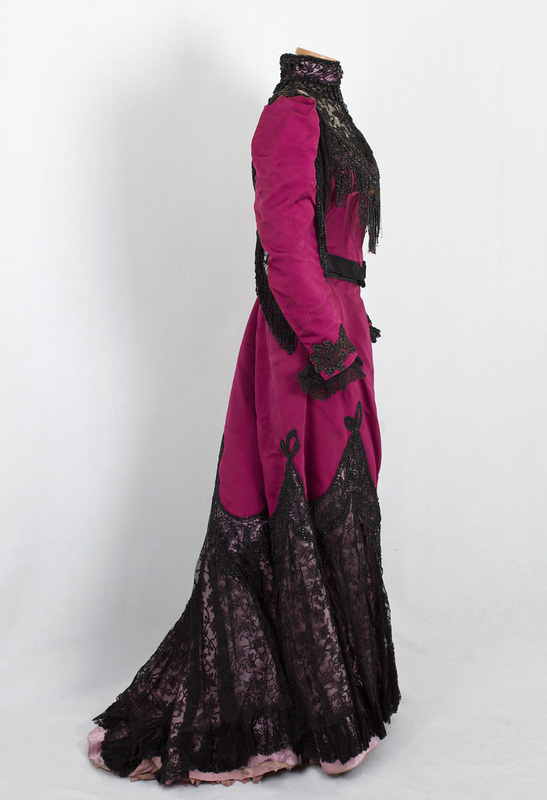 It measures: 38" bust, 26" waist, and 41" skirt-front length. 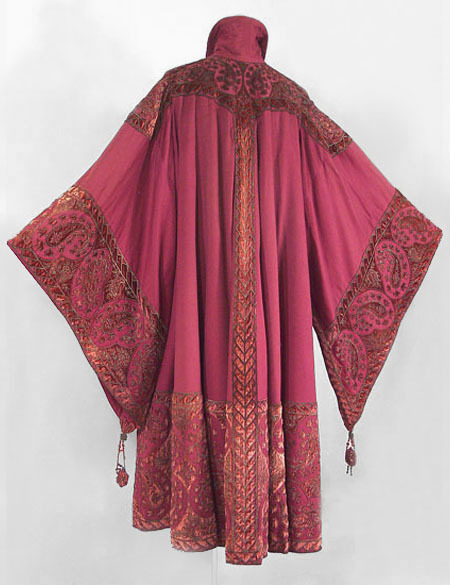 The magenta silk faille is in excellent durable condition. 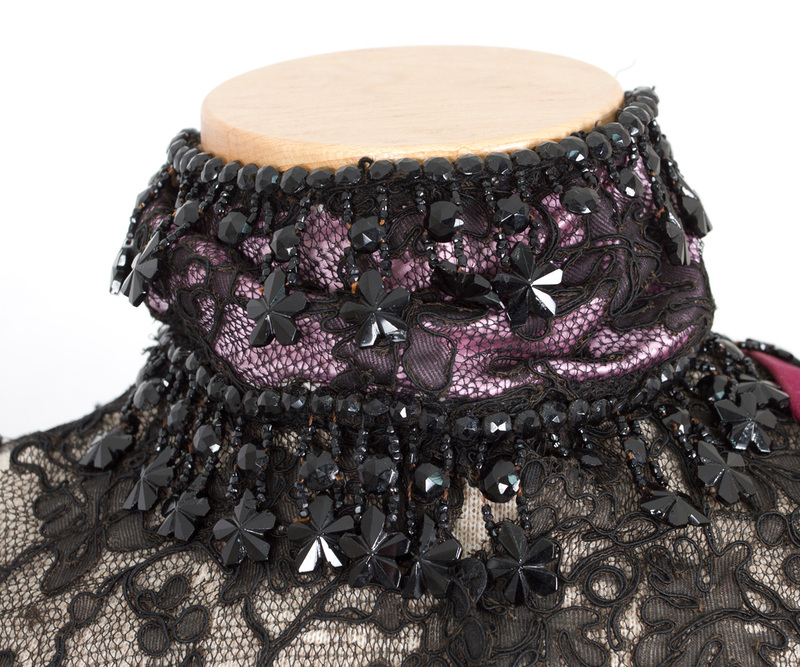 The dress is trimmed with black lace, black jet beads, and black satin ribbon. 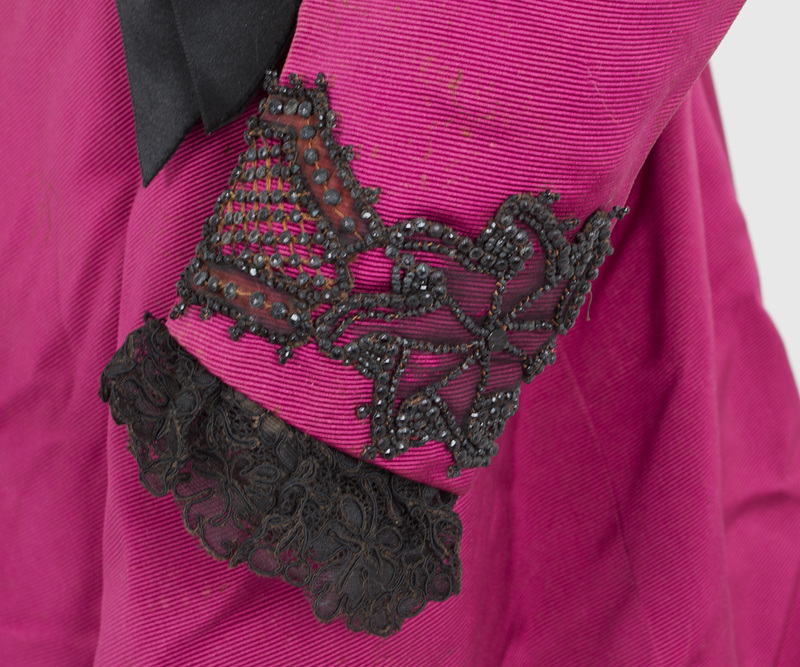 The upper part of the skirt is lined with aqua satin. 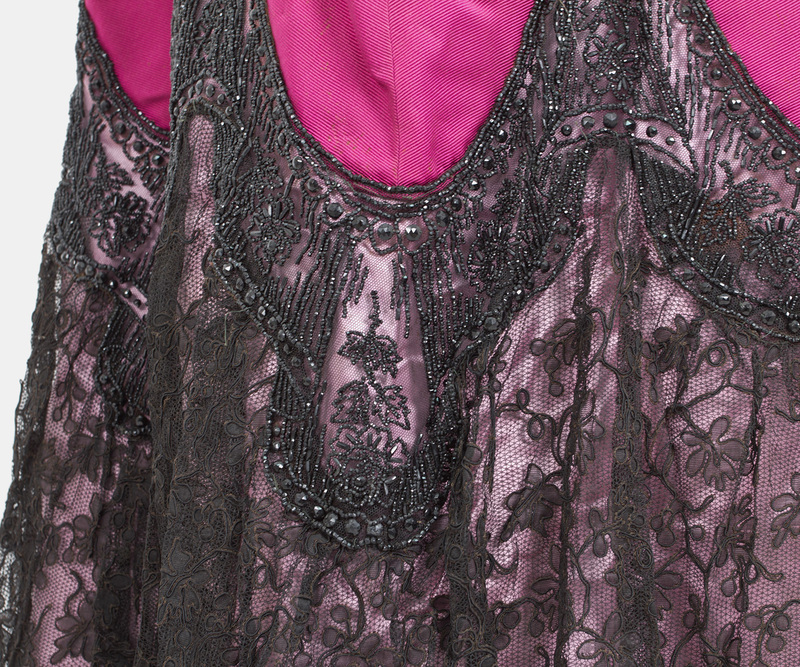 The lower part of the skirt has a wide border of lilac satin behind the black lace. 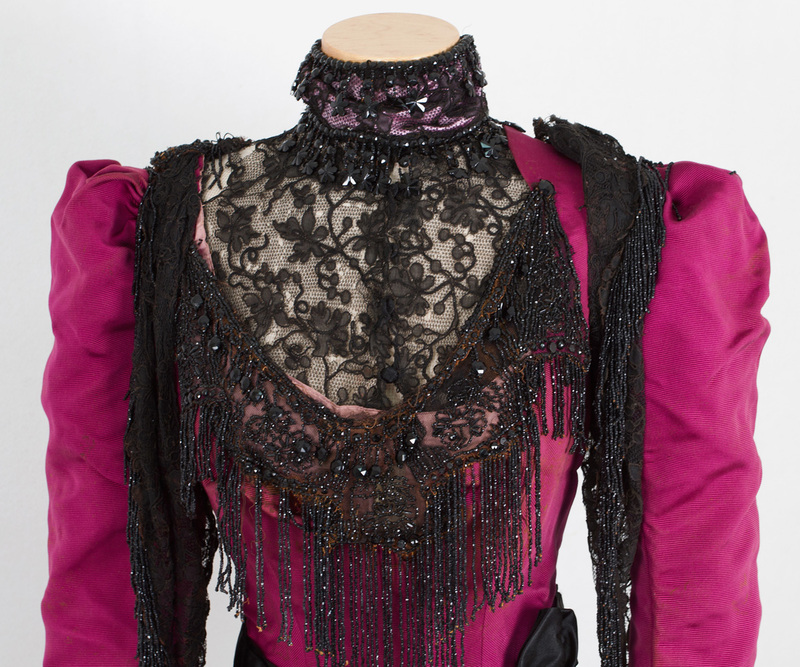 The bodice is boned and lined with lilac taffeta. 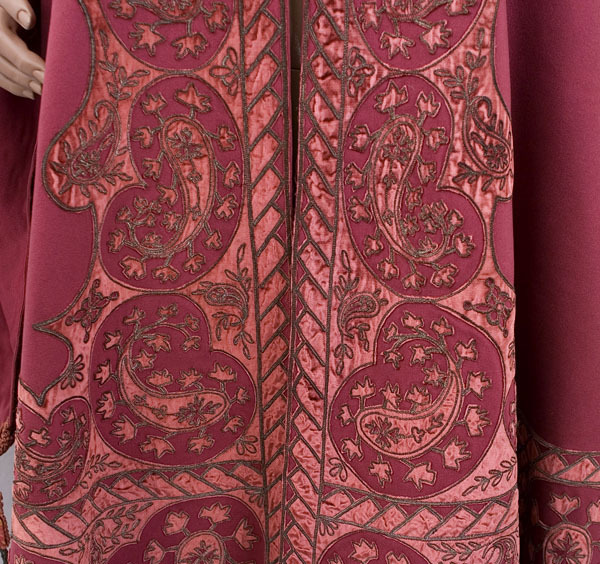 The fine hand finishing and the couture construction techniques make the inside almost as beautiful as the exterior. The condition is very good. 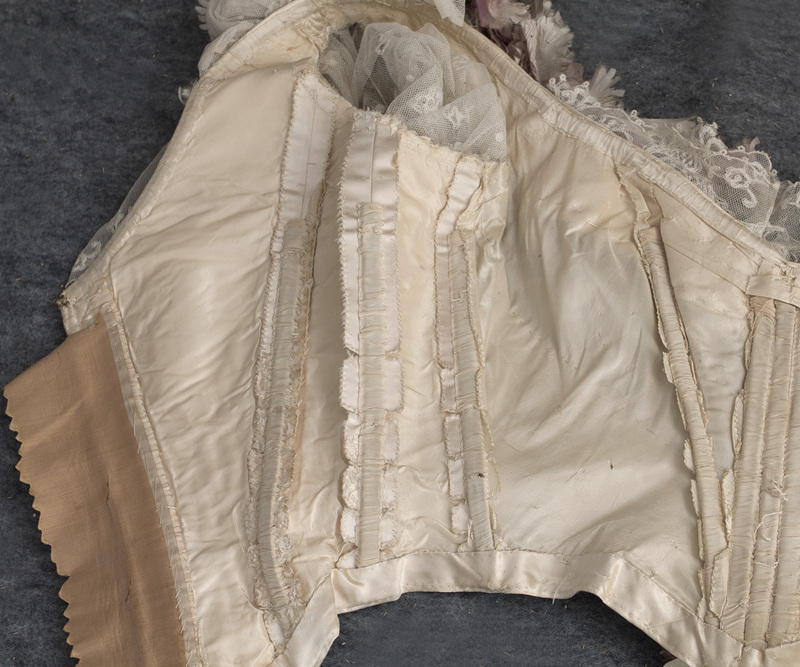 The condition of the skirt is excellent; all of the problems are in the bodice. 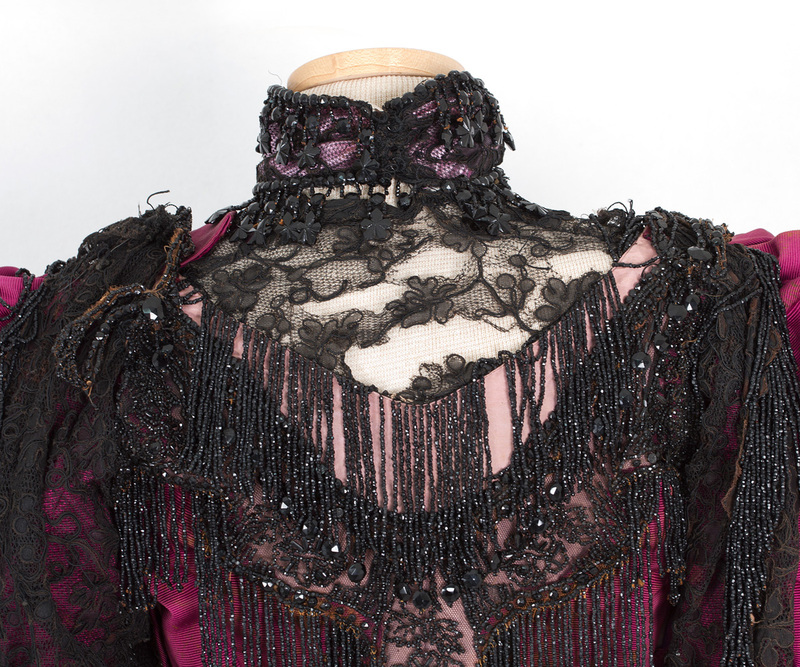 The main one is the deterioration of the black lace at the neckline. 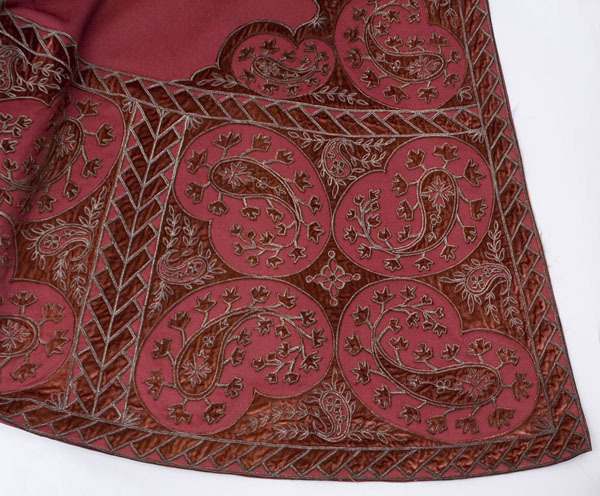 Since this is not rare handmade lace, you can find a suitable replacement. It measures: 34" bust, 24" waist, and 41" center-front skirt length. 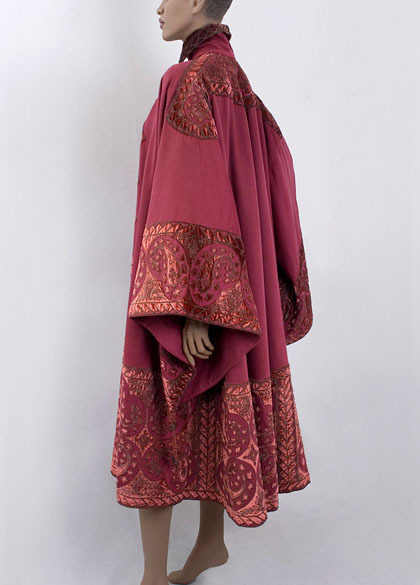 This superlative numbered coat was created by Jean-Philippe Worth. 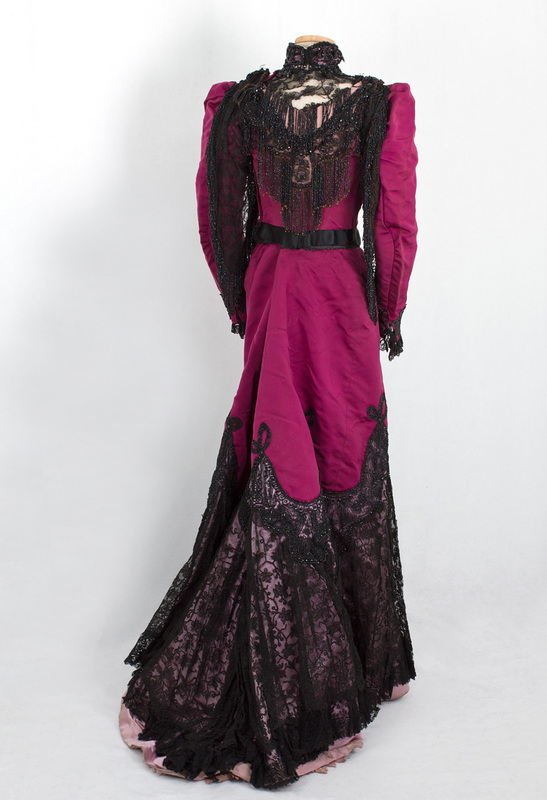 Charles Frederick Worth died in 1895, then Jean-Philippe became head designer. As a young man, he had studied under painter Camille Corot. 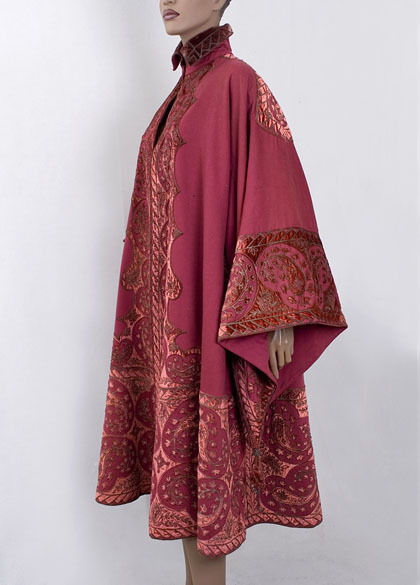 For at least 10 years prior to his father's death, Jean-Philippe designed alongside Charles. 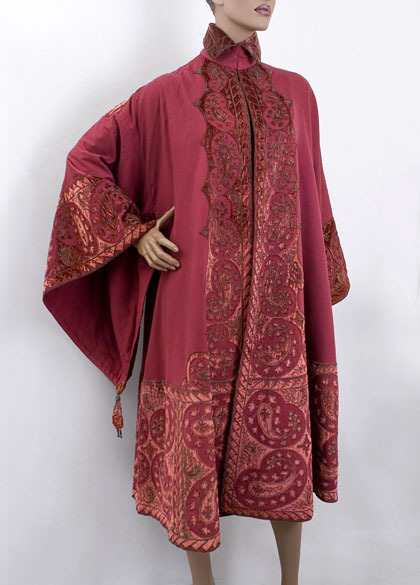 Paul Poiret considered Jean-Philippe to be a more creative couturier than his famous father. 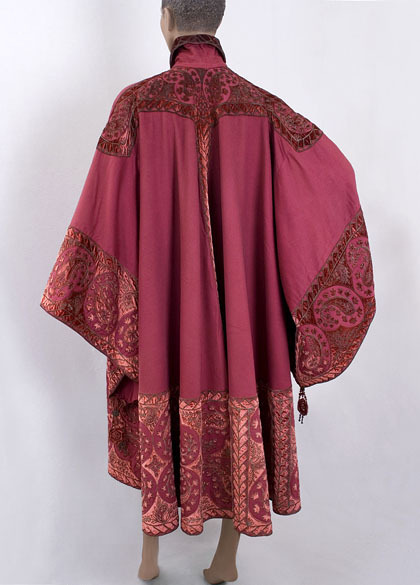 The coat was made from cranberry red wool broadcloth with a satin-finish-smooth pile. 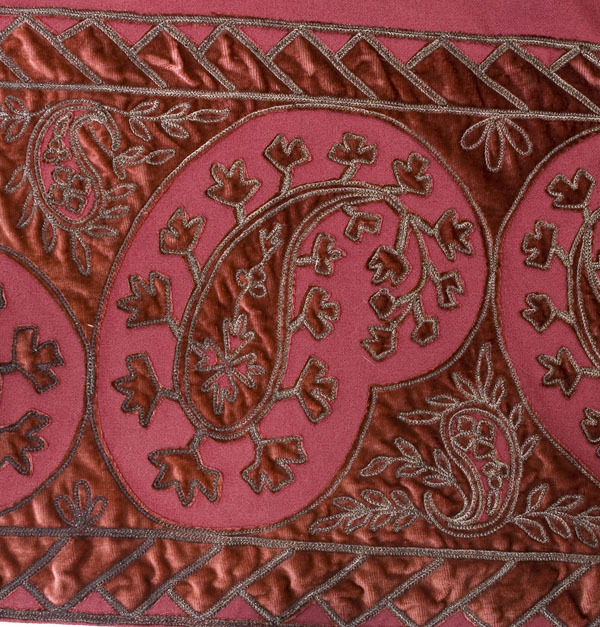 The border design is appliquéd with rose velvet outlined with silver braided cord. 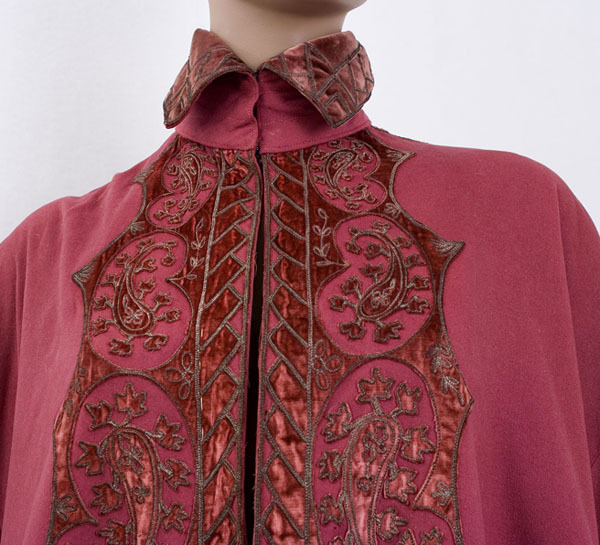 The color of the velvet trim shifts from rose to burgundy depending on the reflection of light on the pile. 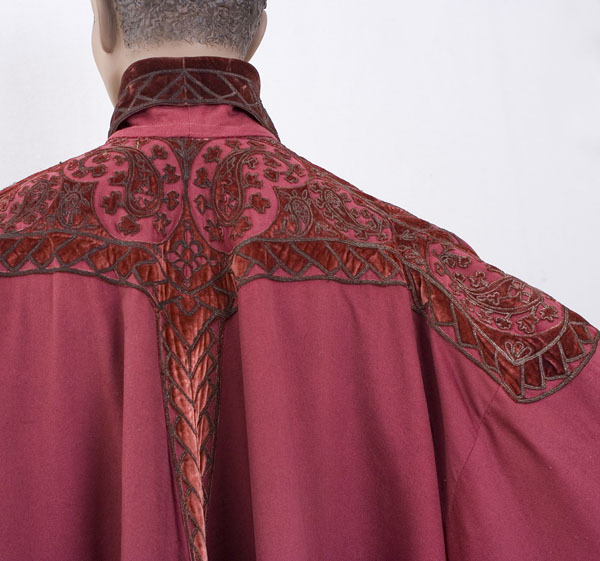 With a circular cut, the spectacular coat is smooth across the shoulders, falling to the hem in deep folds. The ethnic-inspired, wide pointed sleeves terminate in elaborately braided tassels. 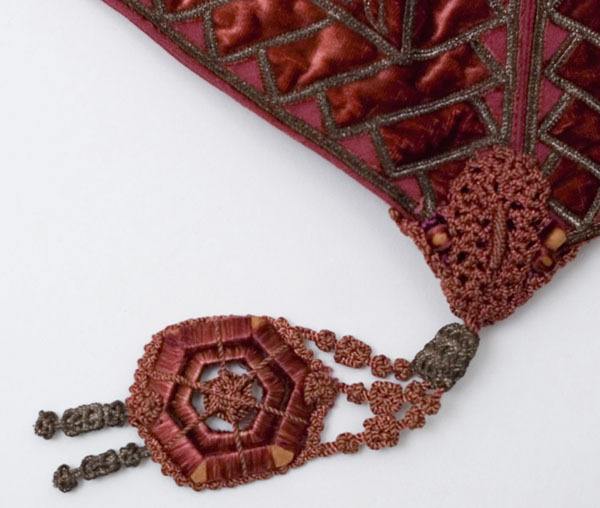 The three hooks on the high stand-up collar are the only closure. 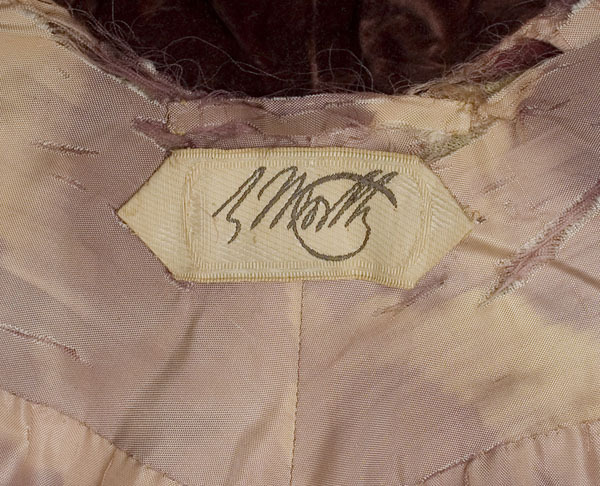 The coat is lined with gray silk. The condition is very good. 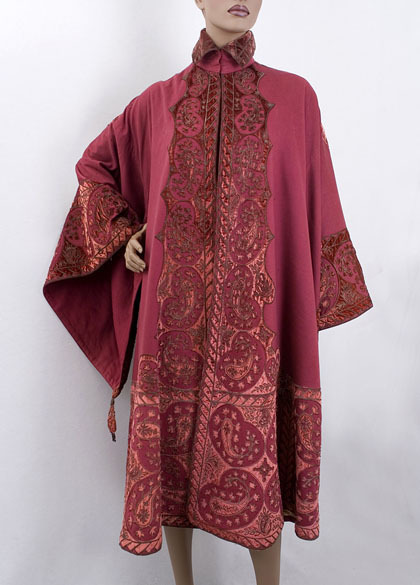 The coat has a few tiny moth nibbles; the lining has splits. These minor problems do not detract from the peerless design. It is 48" long at the center-back. If I were the owner, I would donate it to museum and got my name immortalized on the donor's plate. And maybe some tax reduction! 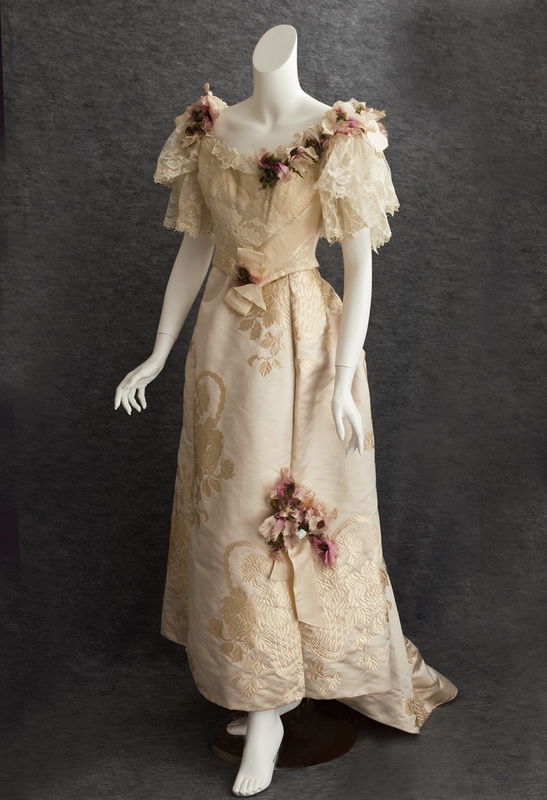 So, either you want it for a research or compliment your museum collection (if you have one), or maybe you're a fashion design student, or maybe simply a couture admirer, these dresses are so Worth it! Signorefandi, please don't tell eBay-ers. They'd resell it and I'd lost track!